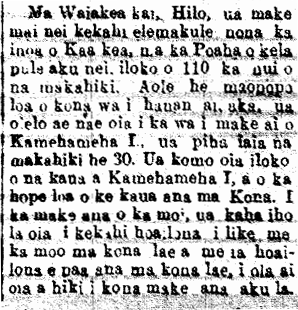 Kaa kea of Waiakea dies at 110 years old, 1898. At Waiakea Kai, Hilo, an old man just died whose name was Kaa kea, on Thursday last, at 110 years old. It is not exactly known when he was born, however, he stated that he was 30 years old when Kamehameha I died. He joined in the battles of Kamehameha I, and at the last battle in Kona. At the death of the king, he slashed a mark like a moo on his forehead, and he lived with this mark until his death. Ke Aloha Aina, Buke IV, Helu 7, Aoao 7. Feberuari 12, 1898. HIDDEN CAVE AT KULAOKAIWIULA, OAHU. While Mr. Koha was digging the foundation of his house at Kulaokaiwiula [Kekulaokaiwiula], he excavated some rocks, and as he noticed a flat rock he put exerted himself in pulling it up; as he shoved down his crowbar, it slipped in and wind came blowing up from the earth. Discovering this new thing, he fetched some people to come and see it. They pried up the rock. After they saw this, Mr. Koha supposed that it possibly was a hidden cave [luahuna], although the bottom couldn’t be clearly seen because it was dark. After this great discovery, Mr. Koha put out an announcement, so that it would be clear whether it was a hidden cave or not. There was someone who was associated with this hidden cave on Hawaii, the grandchild of the caretaker of the luahuna previously. When he saw Koha’s ad about this thing, he came at once to check if what was advertised was true. He arrived on Oahu and stayed with Koha at Kulaokaiwiula, and that was when that man from Hawaii told him about what was in that cave. Being that there was no water at this place, Kulaokaiwiula, when Koha was living there, you had to go far to fetch water; however, according to what the man from Hawaii said, there was a spring in the cave, and so that problem was solved, although you had to go down with a light [kuikui] to get the water. Once, Koha and the man from Hawaii tried to go down in the cave. When the went, the man pointed out the different paths of the cave. This is what he described: On path went and exited at Kalalau, Kauai; and another path went and exited at Kahana, Koolauloa. The path heading to Kahana was not to be travelled by man, for it was guarded by a moo. Another time, they started taking the path which headed towards Kauai. When Koha saw this path, he was astounded to see human bones laid out, being “these were bones of ancient chiefs,” according to the kamaaina. Also here were implements, like a konane board, kilu, hula sticks [laau kaka hula], and other valuable items. The alii of old were fond of entertainment. As they continued on, he noticed there was something dripping down, so he urged his companion to turn back, and so they returned and did not go all the way. There are more things dealing with the hidden cave, but this is what I know. 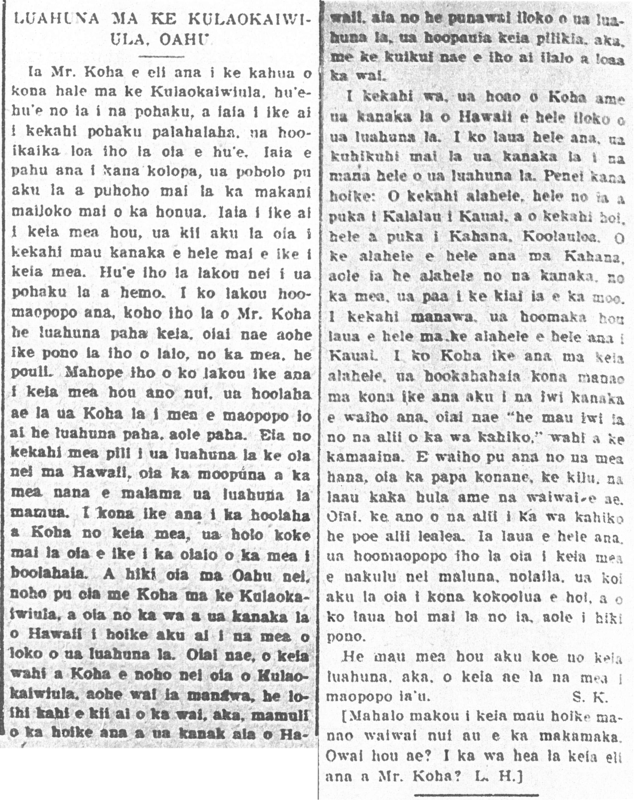 S. K.
Ka Nupepa Kuokoa, Buke XXXVI, Helu 13, Aoao 2. 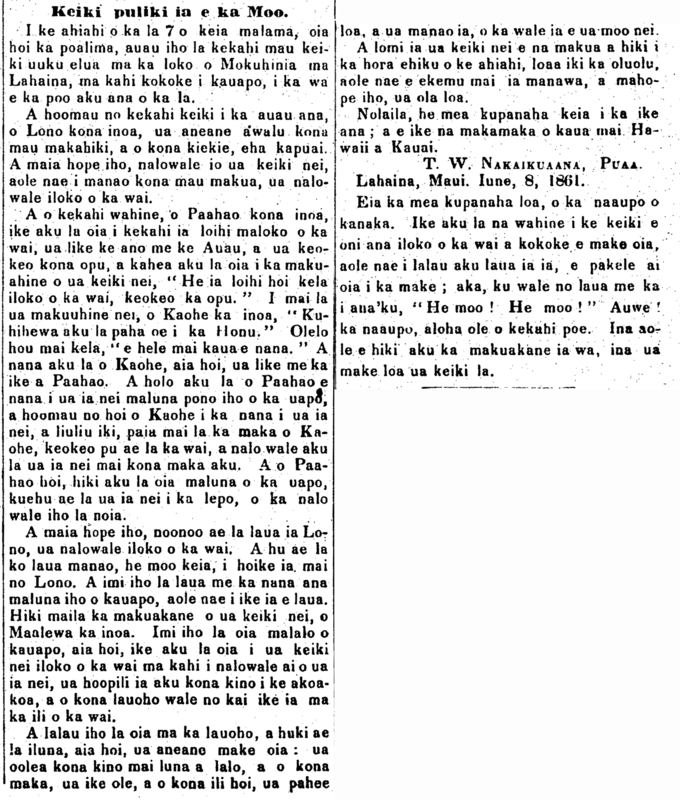 Maraki 26, 1897. Moo at Mokuhinia, Lahaina, 1861. On the evening of the 7th of this month, that being a Friday, a couple of small children were bathing in Mokuhinia Pond in Lahaina, close to the bridge [uapo], when the sun was going down. One of them continued to bathe, his name was Lono; he was almost eight years old, and his height was four feet. Right then after, this boy plain disappeared, but his parents did not think that he disappeared in the water. A woman named Paahao saw a long fish in the water like an Swordfish [Auau], and its belly was white; she called out to the mother of the boy, “There is a long fish in the water with a white belly.” The mother named Kaohe said, “You must be confusing it with a Turtle.” The other responded, “Let’s go and see.” Kaohe went, and lo and behold, it was as Paahao had seen. Paahao went to go see the fish from atop the bridge while Kaohe continued to watch the fish; after a little time, Kaohe’s eyes were struck [temporarily blinded? “paia mai la ka maka”] and the water turned white, and the fish disappeared from her sight. As for Paahao, she arrived atop the bridge and the fish sprayed up dust, and it disappeared. Then after, the two thought of Lono, and that he disappeared in the water. And they concluded that this was a moo that had revealed itself for Lono. They searched and went to look on the bridge, but it was not seen. The father of the boy arrived, named Maalewa. He looked under the bridge, and come to find out, he saw the boy in the water where he was hidden by the moo; his body was attached to the coral and his hair was all that could be seen on the surface of the water. The father grabbed him by the hair, and pulled him up, and he was almost dead; his body was stiff from top to bottom, and his eyes could not see, and his skin was slimy, which was believed to be the slime of the moo. He was massaged by his parents until seven in the evening, whereupon he got slightly better but did not say a word, but later he revived. Therefore, this was something miraculous to see; let it be known to all our friends from Hawaii to Kauai. Lahaina, Maui. June 8, 1861. This is the remarkable thing; the foolishness of man. The women saw the child shaking in the water, close to dying, and they did not grab him and save him; but they just stood there saying, “A moo! A moo!” Auwe! the foolishness and heartlessness of some people. If the father had not arrived then, the child would be dead. [I posted this article a long time ago on the Hoolaupai Facebook page, but because it has such bad search capabilities, i can’t find it. That is one of the reasons i started this blog. Searching for names or places or subjects, etc., is so much easier to do! Ka Hae Hawaii, Buke 6, Ano Hou.—Helu 11, Aoao 41. Iune 12, 1861.